Biotechnology Calendar, Inc. events help lab supply companies distinguish themselves from the competition by aligning themselves with an event researchers at Duke University trust. Our on-campus contacts spread the word about our life science events so that companies who exhibit have the opportunity to meet researchers in the thick of scientific discovery at Duke University. The researchers, lab managers and purchasing agents who attend our events have taken time out of their day specifically to talk about their labs’ research goals, relate their product and service needs, and form relationships with sales reps who can help them conduct research more quickly and economically, as well as reduce environmental waste. Lab suppliers working to sell lab equipment and meet researchers at Duke University life science events may be interested to know that Duke is an increasingly well-funded market. Duke University received $355.6 million in life science funding from the NIH in 2012. A full list of life science departments receiving NIH funding organized by department, number of awards received and total funding rewarded can be found on the NIH website. In addition to receiving life science research funding from the NIH, Duke University also received $46 million from the NSF in 2012. Given these impressive funding statistics and the quality shows Biotechnology Calendar, Inc. organizes, lab suppliers may want to consider meeting researchers and selling lab equipment at Duke University life science marketing events. 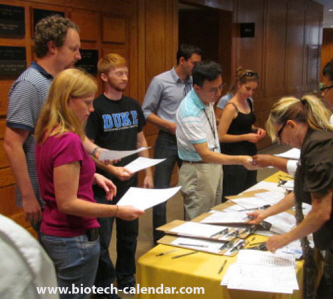 Biotechnology Calendar, Inc. invites lab suppliers in North Carolina to attend our annual Duke BioResearch Product Faire™ Event on May 8th, 2014. In 2012, the Duke BioResearch Product Faire™ Event attracted 228 attendees. Of those who attended, 72 were purchasing agents, professors and post docs, and 35 were lab managers. The visitors came from 21 research buildings and 41 departments across campus. We would like to let lab suppliers interested in exhibiting at Duke University know that they can increase their visibility and gain brand recognition at competitive prices by purchasing through our Fall Special. This special ends on November 1st, 2013, so lab suppliers will want to act quickly to gain this added value at Biotechnology Calendar, Inc. shows. Biotechnology Calendar, Inc. is a full-service science research marketing and events-planning company that has been organizing life science marketing events at top research universities across the country for 20 years. If you are interested in marketing your products at life science events closer to home, we encourage you to view our 2014 calendar of events. If you are a lab supplier interested in working to sell lab equipment and meet researchers at Duke University life events, or you would like to learn more about Duke University funding statistics, click on the button below.